Meeting all your failure mode and effects analysis needs in one well-crafted software package. Relyence FMEA has built-in templates for AIAG, SAE, and MIL-STD-1629 analyses and supports Process Flow Diagrams, Control Plans, piece-part FMECAs, and FMD-2016 to keep you in compliance with accepted standards. 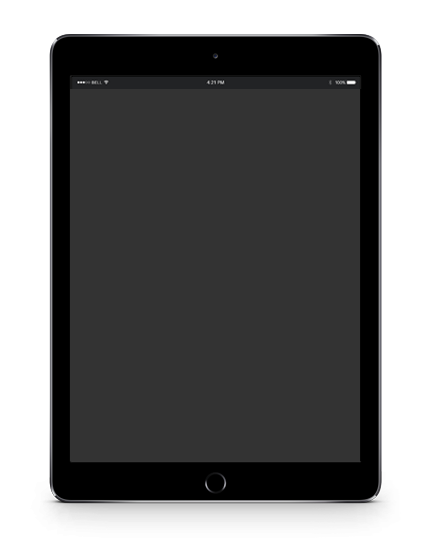 You can use our built-in templates as-is, customize them to your needs, or start from scratch to create your own. Complete customization means your worksheets, reports, and dashboards are tailored to your needs! Relyence FMEA’s unique always-in-sync™ technology, powerful Knowledge Bank™ for reusability, and a host of other Relyence-only features means that your analyses are complete, efficient, and effective. 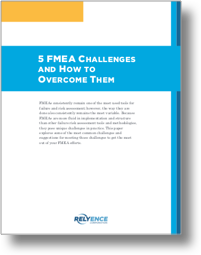 Download our white paper: "Overcoming FMEA Challenges"
Relyence FMEA Software allows you to perform any type of analysis you choose: Design FMEAs, Process FMEAs (including Process Flow Diagrams and Control Plans), piece-part FMECAs, as well as completely custom configurations. Select from the supplied templates supporting SAE J1739, ARP5580, AIAG, MIL-STD-1629A methodologies, or create a custom template. Relyence’s Knowledge Banktm provides powerful data reuse capabilities that automate your analyses for unmatched organization and efficiency. And Relyence’s always-in-sync™ technology keeps your information in sync across your Process Flow Diagrams, Process FMEAs, and Control Plans for complete process control and management. 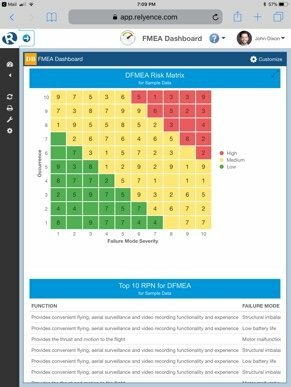 Along with managing your core tasks with ease and efficiency, the Relyence FMEA software incorporates a power-packed list of capabilities: FMD-2016 support, customized reports, dashboard overviews, data import and export, an API interface, audit trails, team management with user and group permissions, and much more. Take us for a test drive. No commitment, no hassle. Just sign up today to see Relyence FMEA in action. Our two-week trial requires no download or installation and includes all the features and functions of our complete package. Or, if you’d like a personalized demo, feel free to call our team today to schedule a time. You won’t be disappointed! 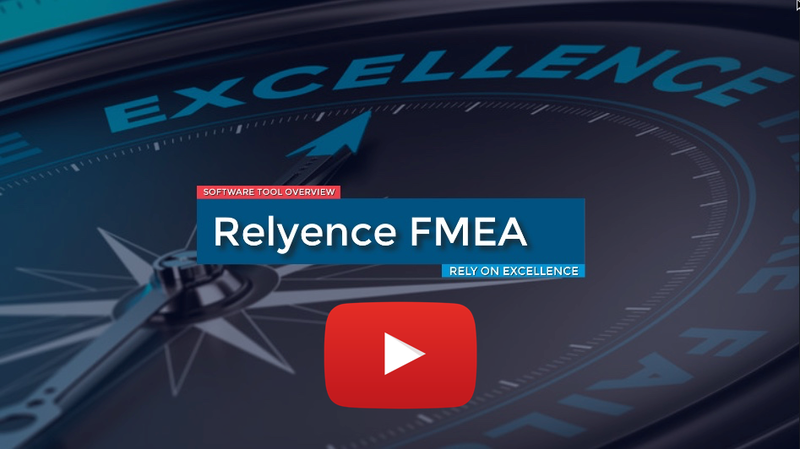 Discover the unparalleled features that make Relyence the choice platform for FMEA software and FMECA software analysis. Built-in support for widely accepted standards enables quick start-up. Select from the supplied templates for Design FMEAs, Process FMEAs, and FMECAs supporting SAE J1739 and ARP5580, AIAG methodologies, and MIL-STD-1629A. Complete customization from start to finish! From the front end – modify our built-in templates or create your own fully custom worksheets – to custom reports and easy-to-build dashboards, Relyence FMEA software adapts to your needs. Nothing is better than automating FMEAs. Relyence’s powerful Knowledge Banktm capability means your data is reusable and easily searchable. Complete with data pushes to keep your Analyses in sync at all times. The limitations of using Excel for your FMEAs is quickly apparent once you give Relyence a test run. Collaboration, data reuse, phrase auto-completion, accessibility, and audit trails are just some of the significant advantages. Relyence’s always-in-sync™ feature keeps your information automatically in sync across your PFDs, Worksheets, and Control Plans. Always-in-sync means your FMEAs are always up-to-date and coverage is complete. Relyence FMEA is easily incorporated with your existing systems. Through full data importing and exporting features to our flexible report creation, Relyence FMEA is designed to be an integral part of your product management lifecycle. The Relyence FMEA Software Dashboard gathers and organizes your data for a holistic overview. View overdue recommended actions, a list of team members with pending action items, RPN metrics, risk matrices, and much more. 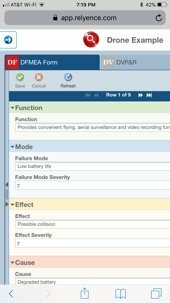 Built with team concepts in mind, Relyence FMEA allows access to your analyses anytime, anywhere, and on any device – including your mobile devices. Collaboration and connectivity are at the heart of Relyence FMEA. Relyence FMEA is also available as part of the Relyence Studio Platform – our fully integrated platform for all your reliability and quality tasks. Data integration is seamless and cross-module dashboards provide an all encompassing overview. How much would your business be impacted if your product or service fails? To put it another way, how much would it be worth to you to have a tool that helps you to avoid failures before they occur? The answer could very well be that it’s priceless to avoid catastrophic failures that could lead to irreparable damage. Fortunately, there are analytical software tools available to help you detect, prevent, and mitigate failures of your products, services, and processes. 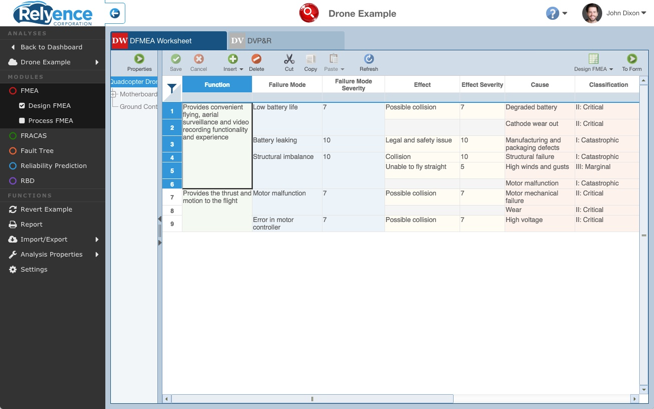 As those associated with ensuring compliance, quality control, or reliability engineering can attest to, failure mode and effects analyses (FMEA) software is a well-known, widely accepted, and beneficial tool for failure and risk assessment. As one of the most popular tools in quality programs, FMEA actually has its roots in the U.S. military’s push to predict and eliminate risks — often associated with quality management improvements for NASA that date back to the 1960s. Of course, the advent of computers has resulted in great strides in the ability to perform risk evaluation. With increased computing power has come FMEA software that greatly enhances both the effectiveness and accuracy of early failure detection and mitigation. For the best results when using software for failure modes effects and criticality analysis, selecting an all-in-one package like Relyence FMEA is the recommended choice of professionals. Supporting all types of failure mode analyses — Design FMEAs, Process FMEAs, piece-part FMECAs, Process Flow Diagrams, Control Plans, and even custom analyses — Relyence is your one-stop partner for all your FMEA software needs. Additionally, Relyence provides compliance for all the most widely accepted FMEA standards: SAE J1739 and ARP5580, AIAG methodologies, and MIL-STD-1629A; and also includes the FMD-2016 failure mode distributions database. Today’s quality control managers and reliability engineers know that when employing FMEA practices, their choice of software is a critical decision. If the FMEA software tool is too basic, the resulting FMEAs are inconsistent, unmanageable, and slow to perform. If the tool is too complex to use, the FMEA process bogs the team down and results in frustration and poor quality FMEAs. Which is why the software standard from Relyence is the tool of choice for FMEA practitioners. With innovative features like Knowledge Bank™ and always-in-sync™ technology wrapped in an intuitive interface, FMEA efficiency and automation is maximized. 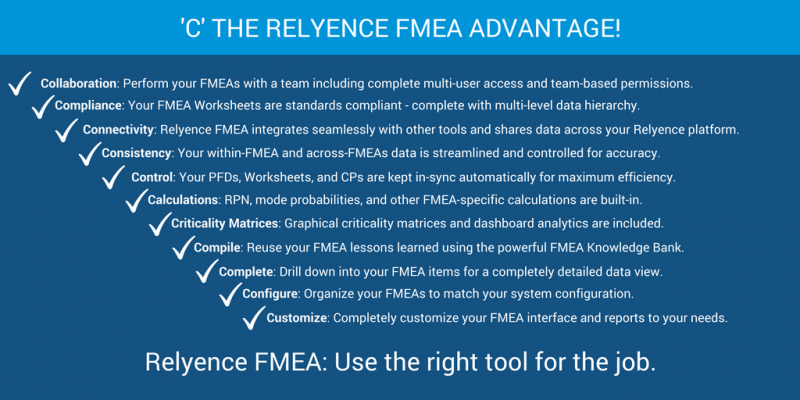 The Relyence advantage eliminates the manual, poorly controlled days of FMEAs and provides a powerful and well-managed approach for complete FMEA process control. Even more reasons why Relyence is the trusted name for FMEA software. Training: While Relyence products are designed to be user-friendly, we offer several opportunities for hands-on training. With Relyence, your team always has access to the training they need to be confident and productive. Professional services implementation: Forget cookie-cutter software packages. 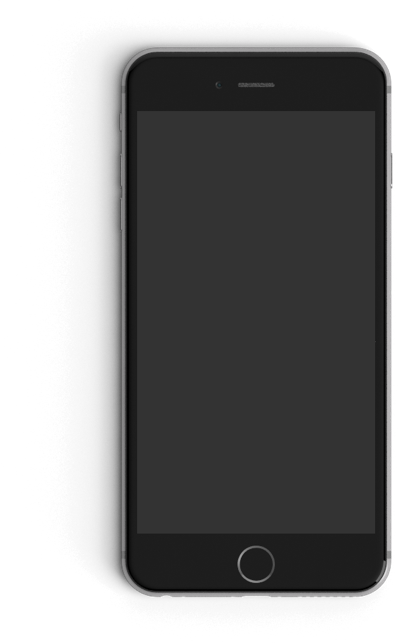 With Relyence, you always have customizable options. With our professional services implementation, we work to understand your processes, so we can make recommendations on everything from configuring our software to importing your current data.  Technical support: We value your business, so we offer highly responsive technical support. From online help and videos to live support and webinars, our customer service personnel are dedicated to supplying you with prompt answers and insider expertise. Check out our blog for more information on FMEAs, Relyence FMEA Software, or other reliability & quality topics.